Aesthetic Value – With a vast array of affordable and weather resistant materials available today, you can create an inviting outdoor environment that adds incredible aesthetic value to the exterior of your home. 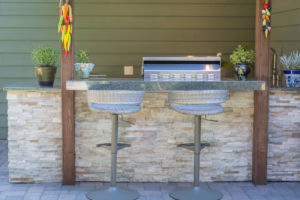 Utilizing an increasing selection of functional materials, it is far easier today to create custom outdoor kitchens and living spaces that will give timeless usefulness and improved quality of life in your home. Functional Value – It has been said that the best room in the house is not in the house at all. The creation of functional outdoor kitchens and living spaces add additional living spaces to your home for family and friends to enjoy. Increased home value – An Outdoor Kitchen can increase the value of your home. An outdoor living space will have significant impact in terms of marketing your home when and if the time comes to sell it. 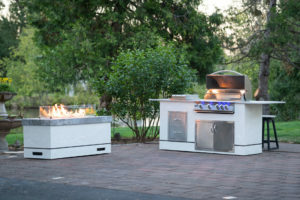 How do we keep the cost of a custom outdoor kitchen low for you? We are a full turnkey designer, component supplier and fabricator of outdoor kitchens – top to bottom! It all starts with a great design and we work with our clients to deliver a functional and aesthetic CAD design that meets every need. Once the client has given their final approval to the design, we fabricate a fully welded custom aluminum frame in our welding shop. These frames are state-of-the-art and provide a structure that will not warp, twist or rust, is mold and moisture resistant and impervious to high heat. You will not have to source out framers, stone masons and contractors to build your support structure out of materials that don’t lend themselves to enduring outdoor environments. Keystone offers full installation services. 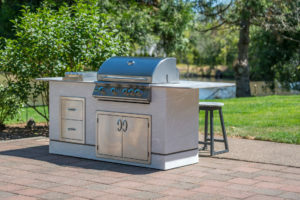 We will deliver your kitchen to your site, install the frame, components, siding and countertops (due to regulations we do not make gas, electrical or plumbing connections) and ensure that when we leave you are 100% satisfied with you new Outdoor Kitchen.